Pop Culture Happy Hour: 'Hidden Figures' And 'One Day At A Time' This week, the women of NASA and the women of a Netflix reboot both get lots of attention, and we close the show with what's making us happy this week. 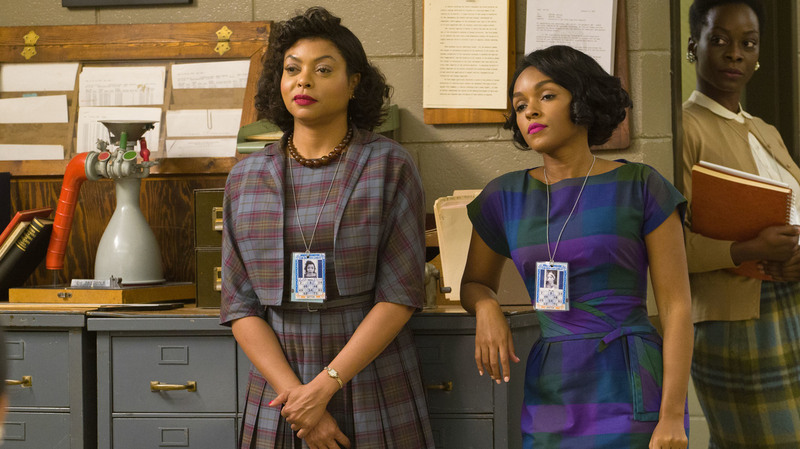 Katherine G Johnson (Taraji P. Henson) as Katherine G. Johnson and Mary Jackson (Janelle Monáe) in Hidden Figures. We are happy to be joined this week by Gimlet's Brittany Luse, the host of For Colored Nerds and the future host of shows not yet invented! Brittany joins us to talk first about Hidden Figures, the high-performing historical drama about black women working in the space program. We talk about the marvelous cast (including Taraji P. Henson, Octavia Spencer, and Janelle Monae), the ways in which such projects inevitably compromise truth with theater, and whether Kevin Costner is all that nice of a guy or all that important to the story. We then tackle one of 2017's early pleasant surprises: the Netflix remake of the '70s and '80s family comedy One Day At A Time. Once again, Norman Lear is on board as a producer, and this time, the family is Cuban-American and the mother is a veteran. And the grandmother is played by Rita Moreno! There's lots to say about this very traditionally formatted, but very nontraditionally messaged, comedy that feels both comforting and fresh. As always, we close with what's making us happy this week. Stephen is happy about a film that — spoiler alert! — we'll be talking about more next week. Glen is also happy about a movie and the performances it highlights. Brittany is happy about a rewatch of a polarizing but interesting television show, and I am happy about lolling around in a hotel bed watching tiny bakers on television. Find us on Facebook or follow us on Twitter: the show, me, Stephen, Glen, Brittany, producer Jessica, and producer emeritus and pal for life Mike.